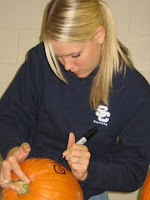 The Beagley's Blog: October Fun! We have had quite a fun October so far! Busy but fun! First off, i got called to be the 2nd councilor for the young womens! It has been such a blast. The girls are so cute and the leaders are so fun. It's been different for me though because there is only a few active girls, and i came from a ward with a crazy number of active girls. So it's been an adjustment but a good one! 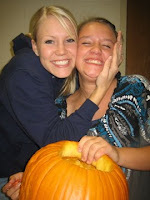 We had a pumpkin carving contest! This was my favorite one~! Next my best friend Danielle Taylor (who plays volleyball for Utah State) had a game at UVU. Since we have moved up to Salt Lake, i was close enough to run down. Tyler didn't get to come because he also got a church calling... 2nd Councilor of the Elders Quorem. So while he had a meeting I ran down to her game. 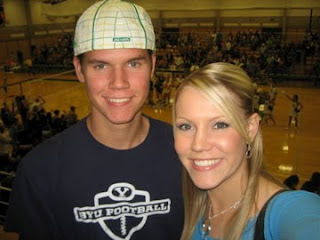 I picked up my brother Riley who goes to UVU and we had fun watching the game! It was a really close intense one and Utah State ended up winning! 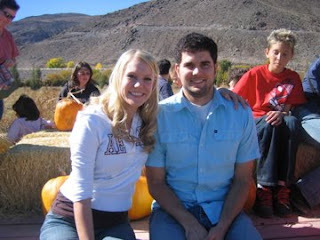 That weekend we went down to Richfield and went to the pumpkin patch with a bunch of family. A tractor pulled you on a huge trailer into the patch and you picked your pumpkins and set them on the trailer. When everyone was done it took you back! It was my first pumpkin patch experience ever! It was fun to see everyone... even though it's a shame that they all live in Salt Lake and we have to go all the way down to Richfield to ever see them! ha ha That was the joke of the weekend. The kids had a blast and it was good to be back in Richfield for the weekend. We also saw some friends and ate good food! Once upon a time when me and Tyler were engaged, we went to Elsinore to a friend's grandpa's house. He had a thing they liked to call "the pentawhirl". 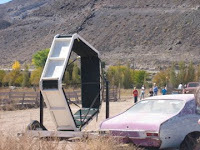 Two people sat in in and your friend could spin you upside down. Me and Tyler volunteered to go first and after about 10 seconds of spinning, Tyler started telling them to stop. As soon as he could get unbuckled he ran to the bushes and started to throw up like crazy. We all though he just got sick from spinning and would be better after a min. I kept spinning with other people and about an hour later we decided to go back home. Tyler was still throwing up about every 5 mins. He asked if i could drive home. We had to go the back way home, and we drove 5 miles an hour. We stopped about 10 times so he could throw up on the side of the road. What is usually a 15-20 min drive was an hour and a half drive. Even then he was violently throwing up. So finally he asked his dad for a blessing because he couldn't do anything except puke and lay down. He slept in the bathroom that night! I was so worried about him! So... Ta da! This is the very pentawhirl! 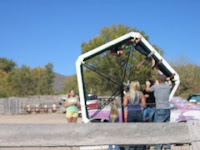 It turns out that the pumpkin patch we went to was our friends grandpa's house and they were letting people spin each other in the pentawhirl. Tyler's cousins wanted to do it so i did it with them, but Tyler steered clear. Ha ha funny memories! It was also Tyler's mom's birthday! HAPPY BIRTHDAY DONNA! We got her a cute Miche bag (the ones that you can change the outside covers). Hope you had a great birthday and we love you! I'm jealous! 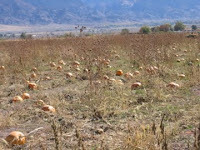 I want to go to a fun pumpkin patch! Sounds fun! Are you guys still planning on coming on Saturday? 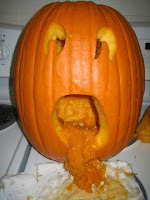 I hope your pumpkin gets feeling better. ha ha you totally saw kyle! good eye! I keep looking at your blog thinking....when is she gonna have a baby???? lol....anytime soon? Hey Cori it has been a while since I saw you last!! Looks like you are doing well. I am glad I found your blog. Hey Cori! So I have a couple friends and we all want to start playing bball a couple nights a week for fun. I am wondering if you'd be interested in joining us? Everyone is from Salt Lake so it would be somewhere around here. Let me know!